It’s been a while since my last post — I know, I know. I could make up wild excuses, beg forgiveness, blame other people for my absence. Instead, I will simply say that sometimes life just plain gets in the way of all the other stuff I have waiting on my to-do list. That said, as a reward for coming back, I offer not one but two — count ’em, two — posts today. One savory and one sweet. Just like me. First up: THE GOOD, THE BAD and THE ZESTY. Second: I NEED A PERK-ME-UP. Let me know your thoughts. There are many good –and bad — things about being unemployed . . . in your 50s. Good: I can sleep in every day if I so choose . . . as it happens, I’ve never been a late sleeper. Bad: No paycheck on the first and 15th of the month . . . nor on the 6th, 12th or the 22nd, for that matter. Good: I can strike up a friendship with my postal carrier . . . because I’m home every day when he comes by. Bad: Our friendship is contingent upon him getting the mental-telepathy messages I silently scream at him as he strides up my front walkway . . . Please, no bills today! Please, no bills today! Please, no bills today! Good: I save oodles of cash by making my lunches at home . . . and eating them there, too. Bad: I’m in danger of becoming a recluse . . . but a recluse with a killer tuna salad recipe. Let’s face it, there are probably thousands, if not millions, of tuna salad recipes floating out there in the universe. Most will vary in specific flavor additives, but likely all begin with two critical ingredients: tuna and mayonnaise. Some people like solid white albacore, while others (like me) prefer the plain old chunk light tuna — which, incidentally, is usually cheaper than the albacore. To each his own. And the mayo, well, that gets trickier. The mayo debate could easily escalate into an international incident if we’re not careful. Sacrilegious as it may sound, I don’t need to use real mayonnaise. In fact, when it comes to the mayo in tuna salad, I really can’t tell the difference between the real and the light. (Did I just hear someone faint?) But, if the truth be known, I usually buy what’s on sale. The other day, as I was making my lunch, I wondered just how much mayonnaise lies in the crevices of the inside of a mayonnaise jar. (These things come up when you have lots of time on your hands.) I found it completely reasonable to expect to get at least another tablespoon or more out of the indentations on the inside of my large mayonnaise jar. And I was determined to do just that. My tuna salad is fairly simple, yet very flavorful — and colorful, too. A neat trick to amp up your recipe? Lemon zest. What fish doesn’t love a refreshing yellow shower of zest? It adds a flavor punch that belies zest’s humble, tiny existence — as opposed to lemon juice, which can make the finished product a bit too soggy for my taste. 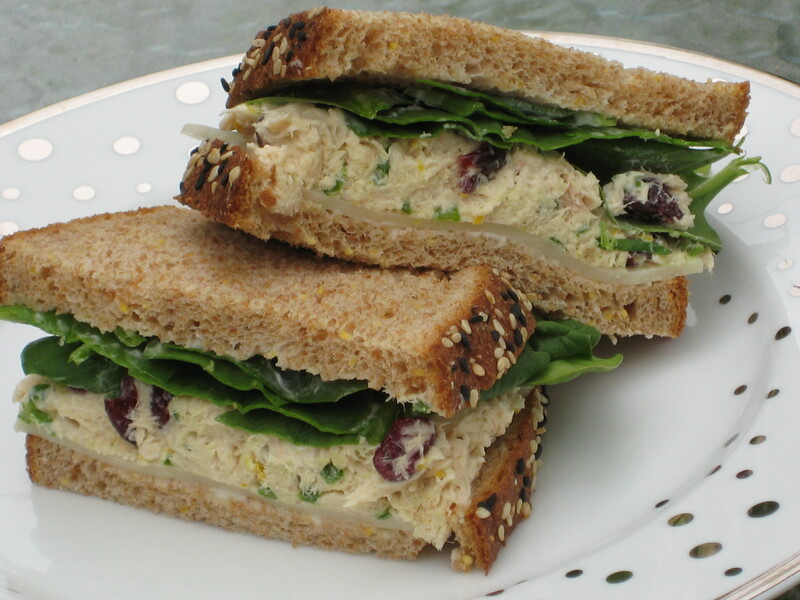 And, taking a nod from my local Whole Foods Market, I add sweetened dried cranberries to my tuna fish, instead of the usual pickle relish, to give it a healthier touch of sweet that works nicely with the tuna and lemon. When I have the time, I like to prepare then refrigerate the tuna salad mixture for at least an hour to allow the flavors to meet, mingle and marry, to complement each other like any good partnership should. Besides, I like my tuna salad cold. Bored with tuna sandwiches? This tuna salad is also very good served in an avocado half sittin’ pretty on a cool bed of butter lettuce alongside alternating slices of fresh tomatoes and hothouse cucumbers. Drizzle the tomato and cuke slices with a tiny bit of Thousand Island or Louie dressing, thinned out with a light squeeze of fresh lemon juice, add a couple of whole wheat crackers and you have a very satisfying, fairly healthy lunch. My mouth is watering, is yours? Mix together first eight ingredients; chill for at least one hour. Assemble as desired on your choice of bread, or serve as a salad in an avocado or tomato half. This entry was posted in Sandwiches & Paninis and tagged lemon zest, lunch, sandwich, tuna fish. Bookmark the permalink. I have no idea why I haven’t thought to put lemon zest in my tuna salad before! Hellooooo, fish and lemon kind of go together. And I love the idea of the cranberries too. Now, I just need to find me some tuna. Don’t you just love lemon zest? It goes with nearly everything! I admit — I love it even more since I got my cool new microplane for zesting. Makes very quick work of a lemon peel. Thanks so much for commenting. My husband likes Tuna a lot and there is a can in freezer (hope it’s not expired). I never tried for sandwiches. After this recipe, next week’s lunch box is planned Glad, I found it. I think your husband will like this recipe, Janine. If he’s not into bread, it is also good with multi-grain crackers.